Creative Density is a coworking space in Uptown. 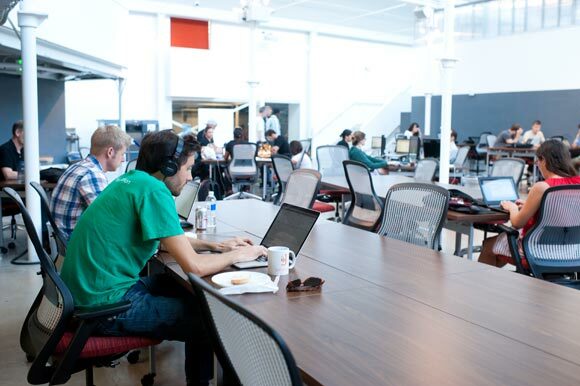 The community workspace at Galvanize at 1062 Delaware Street. Battery621 is at 6th and Santa Fe. The space features stadium seating for events. The lobby at Thrive Cherry Creek. Offices are designed with removable panels so multiple offices can be combined into one that will allow up to 10 people. A lot of natural light comes into Green Spaces. Shift Workspaces spans two buildings. 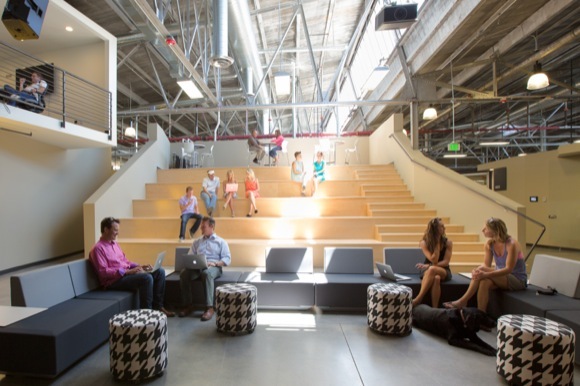 From CEOs to freelancers, coworking facilities are rapidly becoming the workspaces of choice. Cubicles are being traded in for desks in open spaces, and pajamas are being forfeited for more fortuitous laptop setups where productivity is bound to rub off. For those of you unfamiliar with the term, coworking is best defined as a shared workspace inhabited by varying degrees of small business owners and entrepreneurs. The concept had its beginnings in a humble hackerspace in Berlin in 1995 and, after much success, trickled into the United States via San Francisco. About five years ago, just as Denver's startup community was hitting its stride, coworking was the obvious choice when it came to providing affordable office space to bootstrapped entrepreneurs. This office space revolution is here to stay. 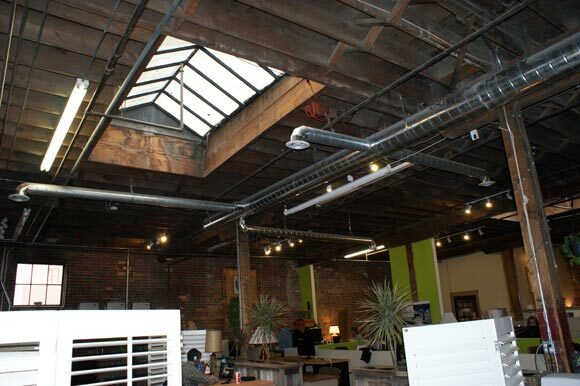 For those needing an introduction, here are some of the coolest spaces in Denver to get your work Zen flowing. 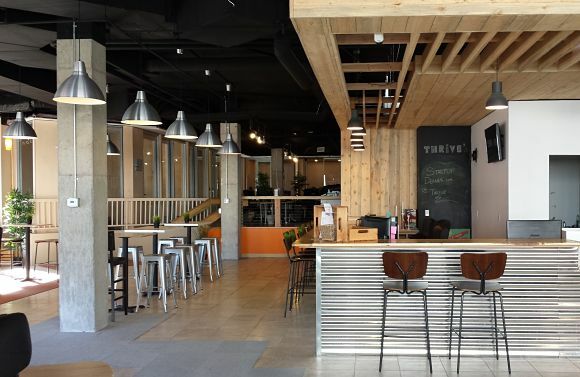 Thrive Workplace has managed to blend the sophisticated with the modern. With its open layout, exposed ceilings and welcoming front lobby this workspace provides a relaxed work atmosphere but is still sleek enough to invite clients over for a coffee. The Cherry Creek location is equipped with a large training room perfect to conduct workshops and training sessions. The tenants range from business professionals, to creatives and everything in between, making it a very conducive place to make connections. 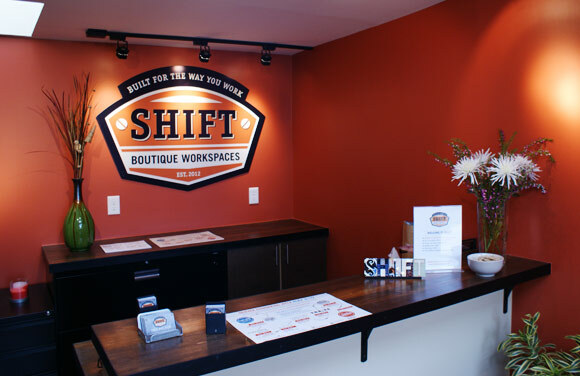 Shift Workspace provides a variety of workspace options and flexibility, making it a great place for those looking for a more businesslike feel but with the amenities of a coworking space. 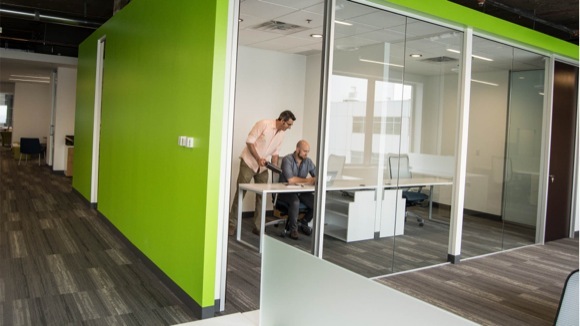 Located near Cherry Creek, this space is a little more private in terms of the desks and office space, yet still provides an open workspace for mobile users. This location just expanded, and two more Shift Workspaces are in the works for the Golden Triangle and Uptown. Targeting the modern professional, Modworks is one of the newest coworking spaces to open downtown. It is unique, as it occupies a traditional high-rise office building -- complete with stellar views of the mountains providing a sense of Denver professionalism. Although new to the game, Modworks is already proving that it has all the amenities needed for a downtown professional, including unlimited use of conference rooms and discounts for local services. For those seeking the ultimate tech start-up scene Galvanize will make your heart flutter as fast as a web developer can code. Self described as the place for high-tech leaders and digital startups Galvanize has entrenched itself in everything the word "startup" evokes. Galvanize houses gSchool a school for developers, Galvanize Ventures (a seed-stage VC fund), and has expanded to three locations in Denver, Boulder and San Francisco -- and soon to be four, once the Central Platte Valley location opens in early 2015. 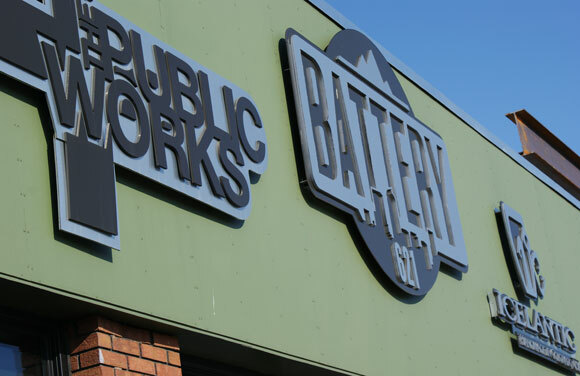 Battery 621 exudes coolness -- much of it to do with tenants like Icelantic and The Public Works. Combine that with a few independent media companies, a coffee company and some other niche entrepreneurs, and you've got yourself an eclectic mix that represents some of the hippest brands in our state. The space itself is great for companies looking to utilize event space as Battery 621 has proven that it can transition into a great after-hours venue, with a dazzling rooftop deck. Complete with a fully functioning photography studio for high-end photo and fashion shoots, Cluster Studios is one of the oldest creative working spaces in Denver and features some of the best resources for creatives. This space is highly customizable and each suite is tailored to the needs of each individual company. Founded by Craig Baute -- a leader in the national coworking movement -- Creative Density was created with the input of its future tenants. Located in the Uptown neighborhood, Creative Density embodies a very organic approach to coworking. Think of a warm, inviting atmosphere, perfect for a freelancer to get some work done and join a space that reflects community values. Industry is the game-changer -- preferring to brand itself as a "shared workspace" as opposed to a coworking space they have taken a well-known concept and made it a catalyst for a renovation of one of Denver's most up-and-coming neighborhoods -- RiNo. The transformation from old warehouse to a highly advanced collaborative workspace, Industry could very well be a metaphor to the innovation renaissance that is pushing Denver into the top tier of startup cities. 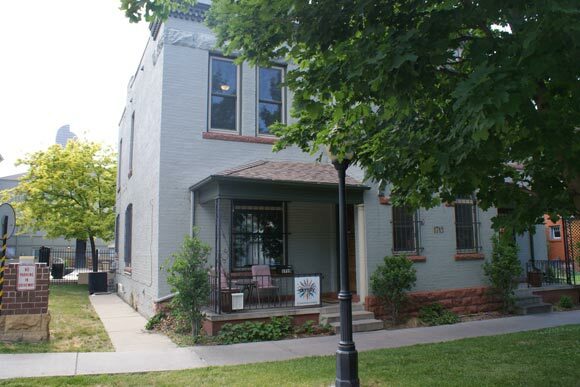 Green Spaces is a favorite Denver coworking space that houses many environmentally and socially conscious startups and nonprofits. A brightly colored, plant-laden, brick-walled space, Green Spaces gives you that warm fuzzy feeling -- it makes you want to be at work even when you don't want to be at work. Plus there are some very cool perks -- yoga AND wine on a Monday? I'm in! The Posner Center houses over 60 organizations with concentrations in global development, social entrepreneurship and innovations in health and education. Although not branded as a coworking space, the center believes that if you can gather all of these organizations in a collaborative space, great things can and will happen. For those working in any related fields, this is a great space to be situated amongst some forward-thinking Denverites. Jessica Kutz is a Denver-based writer and business manager at a Thrive Workplace Solutions. When she isn't doing either of those things, she's planning a trip to South America. Voice of Denver is a featured post from Denver's entrepreneurs, experts and raconteurs. Contact us if you'd like to stand on our soapbox.